Relax with all the colors of the rainbow with our new Rainbow Quartz Bath Bomb from our latest Druzy Bath Bomb Collection. Experience each chakra enhancing color as fresh water and sea salt fragrances ground your senses. Soak in a sea of deep purple as your skin is lavished with fresh water and cleansing greenery fragrances before calming rose, geranium, and hyacinth pair with amber to reactivate your energy flow and bring you to consciousness. Shimmering hues of blue will fill your tub as the bath bomb melts, healing your entire being. Every bath bomb is coated in an aura charging iridescence and druzy inspired brilliance before melting to reveal a ring with an actual, dazzling rainbow druzy, as well as a code with the chance to win a ring worth up to $10,000 through our Enter the Vault Sweepstakes! 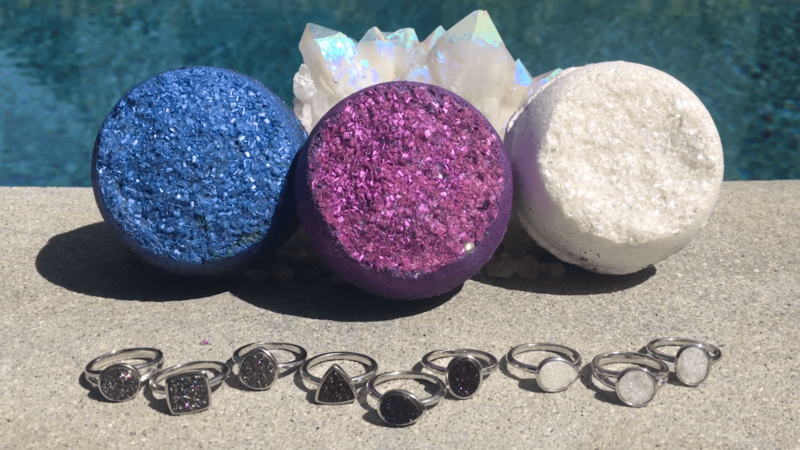 Free Bonus Each Bath Bomb contains a beautiful natural druzy ring! And a code that gives you a chance to win a ring with a retail value between $100 and $10,000!